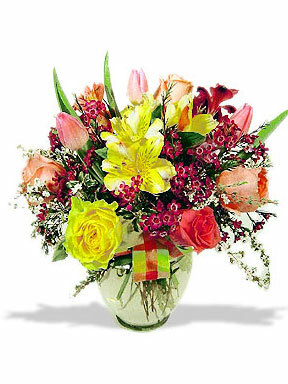 A cheerful assortment of pastel roses, tulips and alstroemeria to brighten any day. Lush filler flowers add a lacy touch and fun accent ribbons make the colors shine. Approx. 12" high and 10" wide. Please note: When Tulips are out-of season (June - December), we substitute bright Gerberas or similar vibrant flowers for them. I just want to say 'thank you' to Cathy for assisting me with my order. She was very professional, kind and so compassionate when I explained to her why the flowers were being sent. My sister received them on schedule and said that they were absolutely beautiful. The flowers were so fresh, vibrant and each flower had such remarkable color. The bouquet surely was a way to brighten her day. Again, Thank you so much. I will continue to call you from time time to place my orders..